Homemade Christmas presents! 😀 I kept seeing awesome tutorials on Pinterest for making mugs or plates using Sharpie pens and baking them in the oven. I finally gave it a shot! 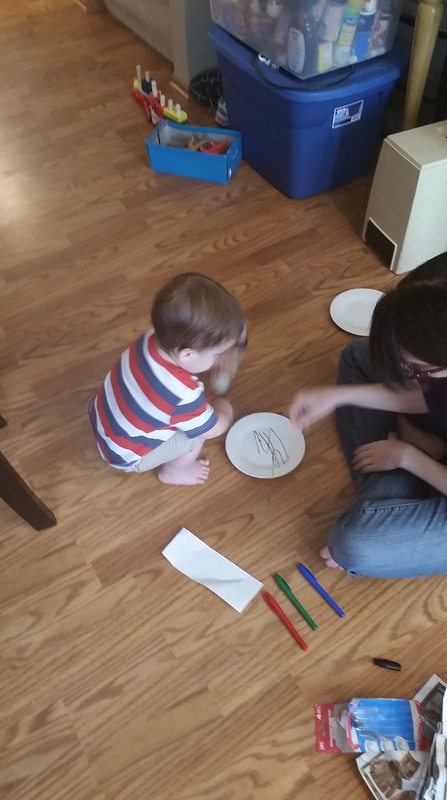 I got all the supplies at The Dollar Tree….plates and some permanent markers. Then I let the Wingman have at it. 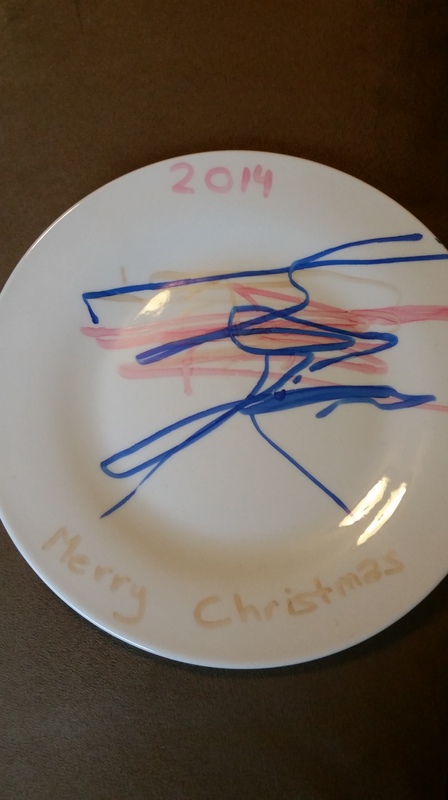 He was much more fascinated with taking the cap on and off the markers, but every now and then he would give the plate a swipe with the marker. After he decorated them all, I put it in the cold oven, then turned it to 450. Once the oven was completely heated, I set the timer for 45 minutes. It only lasted about 30 minutes I think, though, because there was a horrible smell (I’m wondering if it was the stickers that I had forgotten to take off the bottom of the plate?? 😦 ). I then turned off the oven and let the plates remain inside until completely cool. The colors definitely faded a lot in the process. I don’t know if it’s because I used cheap markers or if that is typical. All in all it was fun and pretty simple! I would definitely try this again with some other awesome designs. Pinterest has some great design ideas! 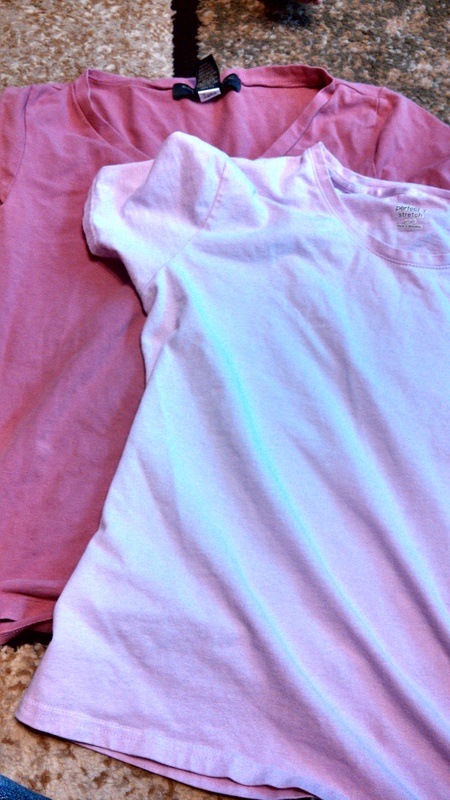 Well I found two plain Jane t shirts in my drawer that I never wore. 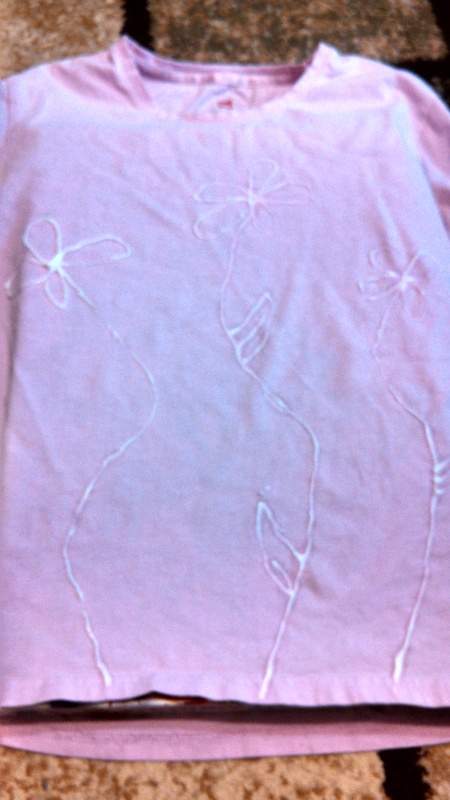 Rather than just getting rid of them I decided to try my hand at making bleach pen shirts again! 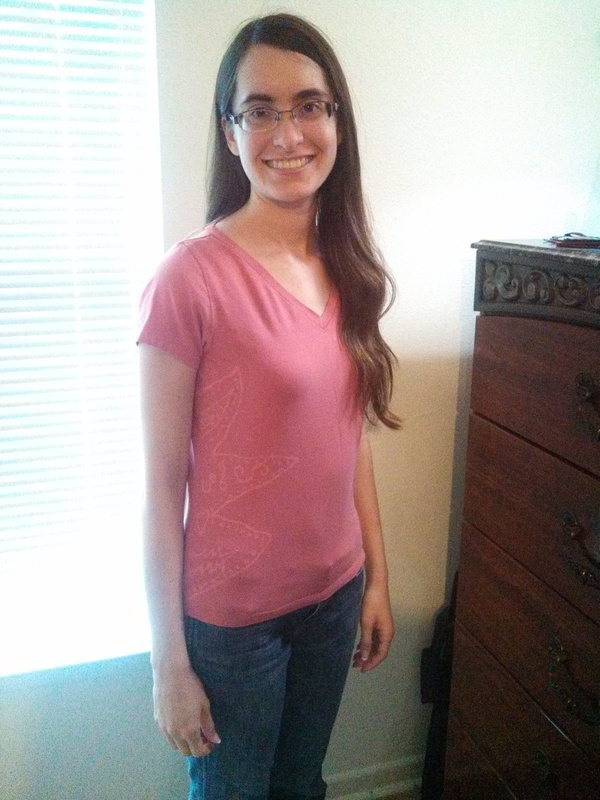 I love the shirt I made last time. The second one turned out better than the first, in my opinion. 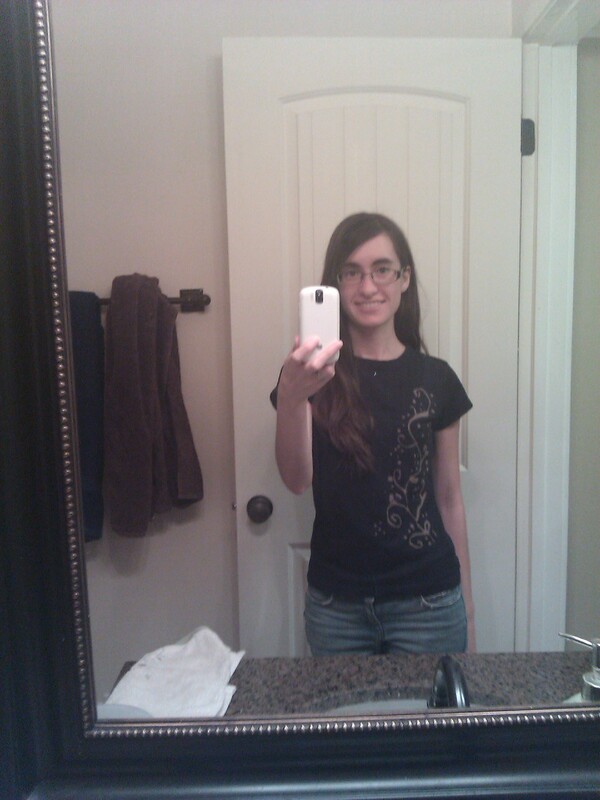 I ended up not leaving the bleach on long enough on the first, so the design is hard to see. Plus the flowers look a little young and girly. This one could have done with a little more bleach time as well, but I also like the more understated look. I am so excited to have finally accomplished a “real” Pinterest project! 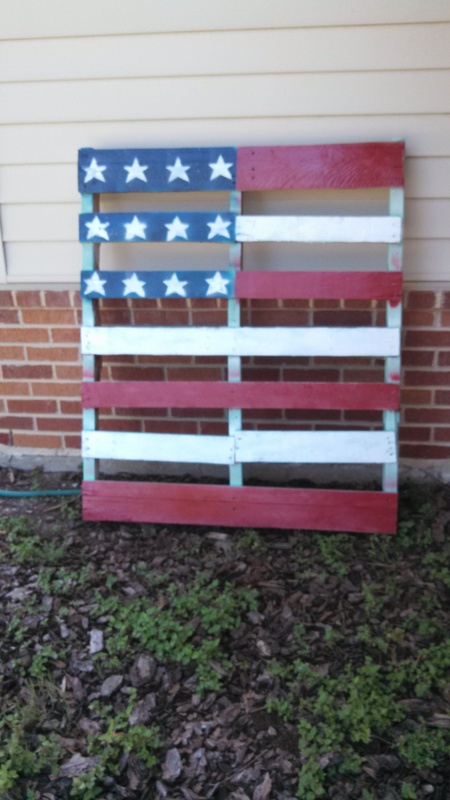 When a friend was giving away some pallets I snatched one up! 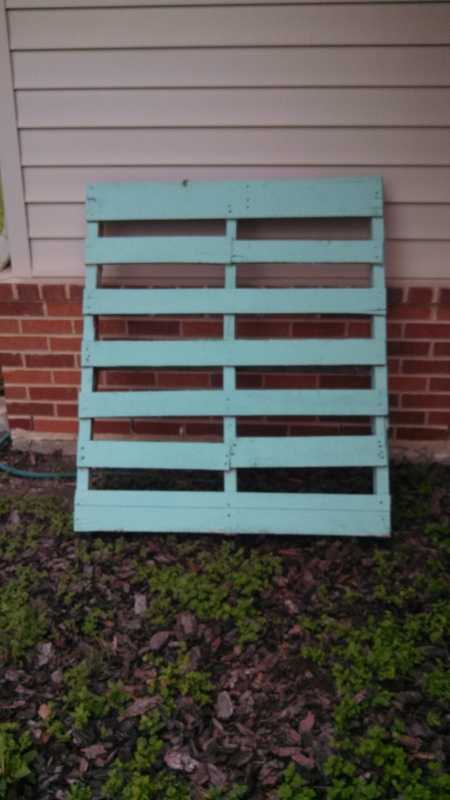 The pallet was originally painted a mint green. I got some spray paint…..
husband traced it for me, as I was having trouble getting them to look okay. Linking up today with Crafty Obsessions! Wyatt made his first Christmas presents this year! I knew that I wanted to do something to incorporate his hand or foot print. Pinterest was full of ideas, as usual. Attempt #1 – Salt Dough Ornaments. This was a fail. We forgot to put holes in them for hanging, the hand and foot impressions were barely visible, and they crumbled as they dried up. 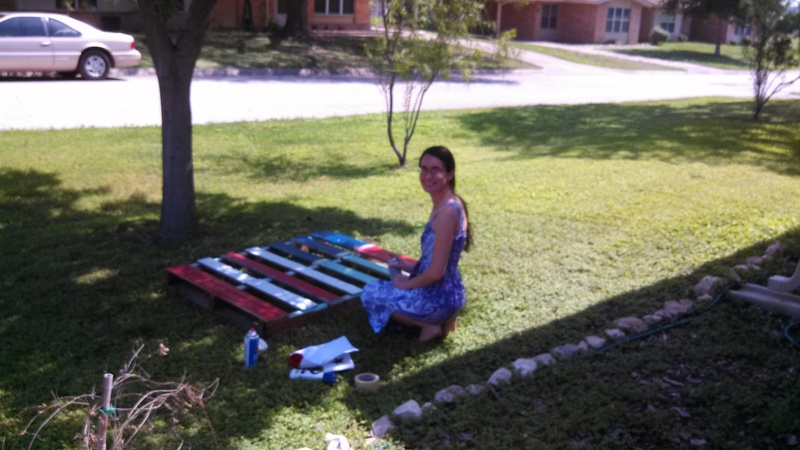 Attempt #2 – Washable paint. We took a rag and applied some paint to the bottom of the Wingman’s foot. This was a fail. His foot just slid all around, rendering the painted imprint only remotely resembling the general shape of a foot. Attempt #3 – Paint pen. Success! 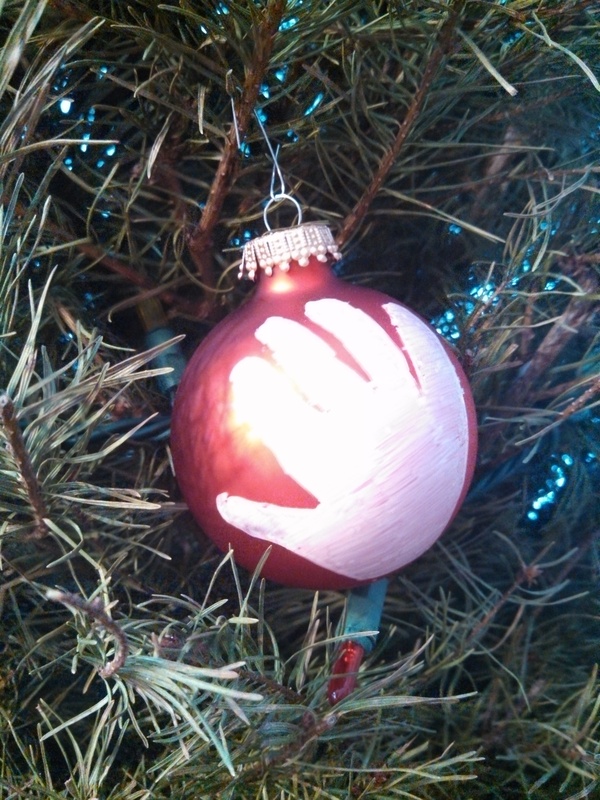 I traced the Wingman’s hand on a piece of paper and used that as a stencil for the ornaments. The first one, I taped the paper on for easier tracing….but when I removed the tape, it removed the color on the ornament. Oops! On the rest of them, I was able to carefully hold the paper in place and trace the hand print. Then I filled it in with the paint pen. Finally I have my own blog post titled that. 😉 Pinterest has so many creative ideas for DIY projects. This week I was so excited to actually try one! This is the post that gave the instructions I followed. Even though it was pretty straight forward, I was so nervous about taking bleach to a shirt and I welcomed the instructions. 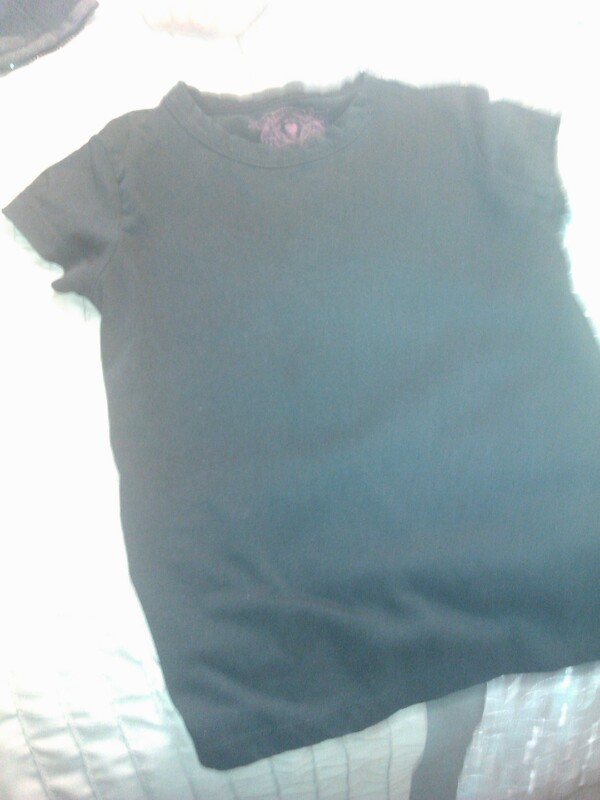 I started with just a plain black t shirt. Sorry for the poor picture quality. wax paper, but I had a small box with drawing supplies in it. 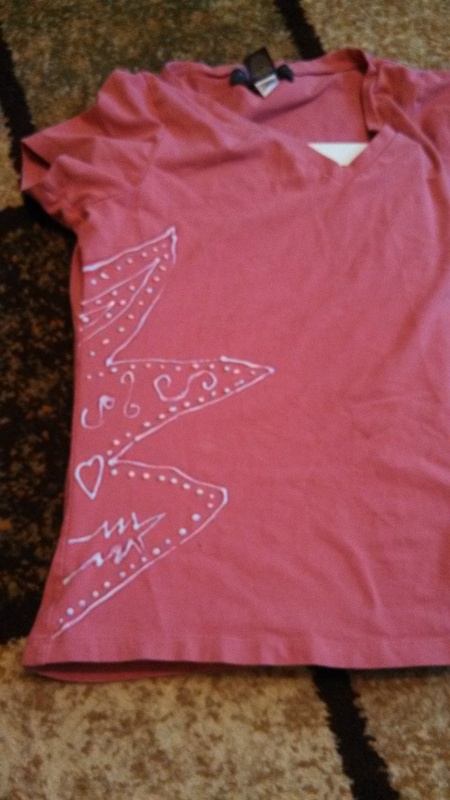 The post said to rinse the excess bleach off using warm, soapy water, but I wasn’t sure how to do that without the bleach spreading to the rest of the shirt. 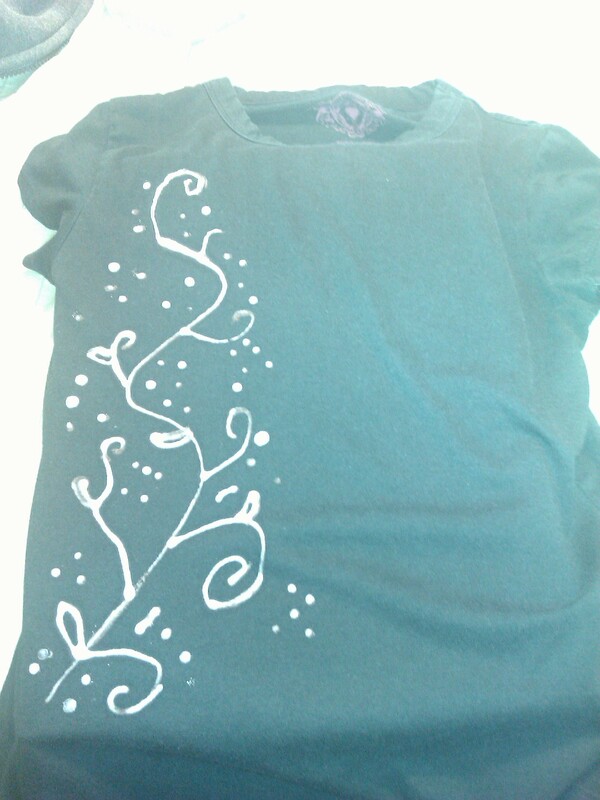 I ended up with quite large bleach blots on my design. Finally, I decided to go for it and thankfully the bleach blots didn’t spread at all. They rinsed right out! All in all, it was a very fun and very simple project that turned a plain T into a cuter alternative!